Measles is caused by a virus and its most common symptom is rash. Persistent measles may also find its way into the central nervous system and the lungs. Baby measles is very fatal. However, measles is not much of a threat today. There is a vaccine that is given to protect one from a measles infection. This vaccine helped curb the death of about 2.6 million people per year. Measles is airborne and is caused by the paramyxovirus. This virus is introduced into the air when an infected person coughs or sneezes. The virus has got a total life span of two hours in the open air. Children that breathe the contaminated air may be infected with measles. Chances of getting the disease for children that have not been immunized are 90%. Once a child is infected, it will take at least ten days to get ill and start showing the signs. You can only transmit the virus four days before and after the rash appears. 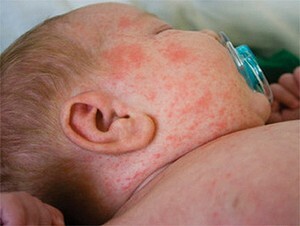 A baby suffering from measles usually shows some symptoms. Here are the first indicators of the infection. A few days after these symptoms occur the baby is then likely to start having rashes. This occurs within less than a week of the first set of symptoms. The rashes start as red spots on the rear side of his or her ears, progresses to the face then neck. This rash is accompanied with fever as well. As days pass by, this rash affects the entire body of the child, which makes the baby’s skin to be bumpy. The child will be itching due to the rash, which could last for as long as five days. As the rash reduces, it leaves the baby’s skin with brown spots and dry. Another symptom associated with measles is feeling sickly and fatigue and suffering from muscles’ pain. The baby might also have problems while sleeping due to coughing. Sometimes it is difficult to tell if a child is suffering from measles or roseola. They have almost the same symptoms. Children suffering from roseola suffer from decreased appetite and fussiness accompanied by fever. The fever lasts from at least three days to a week. In some cases, children will have swollen glands and other respiratory symptoms. Once a child is treated of roseola, the fever disappears abruptly. At this point, the child will look bright and playful. A pinkish-red rash will appear on the chest before spreading throughout the body. The rash is not irritating and takes up to a day to disappear. The main difference between measles vs. roseola is that in measles, the rash will appear when the kid is ill whereas in roseola it appears when the child heals. Roseola vs. measles is hard to differentiate. But children suffering from measles will not look uncomfortable even when ill. In both, there is rash but timing is different. You need to remember that measles is a virus and once your child has shown symptoms, nothing much can be done. You, however, need to give it time and it will be through in a week or so. It is important though to report this to your doctor as any cases of measles needs to be reported. A child suffering from measles cannot be treated but can be given some care that makes them comfortable and recover faster. First of all, you need to keep your child away from other kids and school. This will give him enough time to rest andavoid infecting other kids in the four days before and after the rash. You should give your baby a lot of fluids as this will help in bringing down the fever and preventing dehydration. Regularly breastfeed your baby, offer him formula milk, or give him boiled water that is extra cooled to ensure fluid intake. Sometimes it is important to give your child something to ease the pains and bring down the fever. You should consult with your physician on the correct dosage. Paracetamol or ibuprofen works depending on the age and weight of the child. A child aged two months, born after 36 weeks and weighing three kilograms can be given paracetamol. Those of more than three months and above five kilograms should be given ibuprofen. It is important to try and relieve your child's cough. Cough syrups and other medications may not work in cases of baby measles. You can, however, make his room humid by sprinkling or sparing warm water in it. If the child is more than a year old, then you can try syrup made of honey and lemon. It is quite simple as you need just a glass of warm water, two teaspoons of honey and one spoonful of lemon juice. Stir and then give him the drink. The sure way of preventing your child from baby measles is having him vaccinated. After a child's birth, there is a series of immunizations that will have to be administered at different ages. Measles also has got its own routine. When the child is born, they are protected from measles for the first six months of the immunity they acquired from their mother. An MMR vaccine is offered to the child 13 months after birth. At this point, the child will become protected 90 percent to 95 percent. This immunization will also protect one against mumps and rubella. In case there is a measles outbreak, children can be vaccinated against measles at the age of six months. An MMR vaccine can then be given in the 12-15 month. Children need to be given a second immunization at the age of four to six years. This boosts their immunity up to 99 percent. Some children may suffer side effects due to the measles vaccine. They may either develop a fever between the sixth and the twelfth day after the vaccination or develop a rash that resembles that of measles. This rash should not cause alarm as it is not contagious and fades on its own.